Syria’s Kurds celebrated a notable victory on Monday, removing the last Islamic State fighters from Kobane, the Kurdish center in northern Syria near the Turkish border. The jihadists have attacked Kobane and the surrounding area since September, taking all the nearby villages and at one point more than 40% of the city. In late October, the Islamic State put out a propaganda video, featuring British hostage-turned-spokesman John Cantlie, proclaiming that it would soon rule. However, the Kurdish forces — assisted by Iraqi Kurdish peshmerga, units of the Free Syrian Army, and US-led airstrikes — held their lines and began a slow pushback against the jihadists. In the last two weeks, the Kurdish advance accelerated, and they took the key Mistenur Hill outside the city a few days ago. The Islamic State was reduced to two pockets in Kobane — the National Hospital in the west, and a few streets in the east — which were finally taken on Monday. The Islamic State still holds much of northern and eastern Syria, including the city of Raqqa, the largest outside regime control. It is expected to redeploy forces to support those areas and also to challenge insurgents in Aleppo Province in the northwest. However, the jihadists have taken heavy losses in the attempt to conquer Kobane: how heavy is unknown, but the casualties include several senior commanders. Syria’s Kurds have also suffered the loss of numerous militias, and its civilians have been displaced from Kobane and scores of villages. 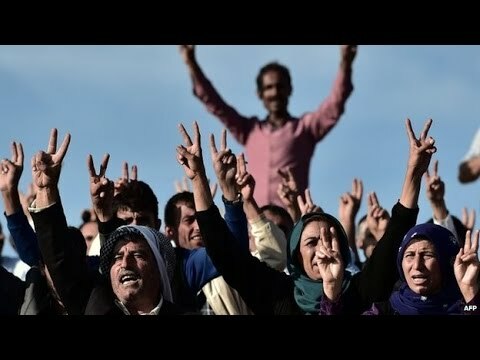 However, on Monday, both the military and symbolic victories were being marked as a sign of the strength of an autonomous Kurdish nation. The victory in Kobani is the victory of the Rojava [Syrian Kurdistan] revolution, martyrs of the resistance, humanity and all who seeks freedom. It was not only a war between ISIS and YPG. It was a war between humanity and barbarity, a war between freedom and oppression. We thank our people, especially the people in northern Kurdistan. We thank the coalition forces for their air support. We thank Burkan al-Firat and other FSA [Free Syrian Army] groups, who fought side-by-side with us. Once again, we thank the Peshmergas who supported us. Israeli forces have fired 20 artillery shells into Syria after at least two rockets hit the northern Israeli-occupied Golan Heights on Tuesday. The exchange of fire comes nine days after an Israeli air strike inside Syria killed Hezbollah and Iranian commanders, as well as several Hezbollah fighters and Iranian personnel. The Israeli military has ordered the evacuation of about 1,000 visitors from the Hermon Mountain ski site, and the closure of the resort until further notice. The Islamic State has threatened to kill Japanese journalist Kenji Goto and Jordanian pilot Muath al-Kasaesbeh if a female Iraqi prisoner, Sajeda Rishawi, is not released from a Jordanian prison within 24 hours. The threat comes three days after another Japanese hostage, Huruna Yukawa, was executed. In an audio message, Goto says, “I have been told that this is my last message….It’s me for her. What’s so difficult to understand?” He holds up a photo of al-Kasaesbeh, captured last month after his aircraft was downed in Syria. Rishawi, imprisoned in 2005, is accused of taking part in bombings in Amman, surviving when her explosive belt failed to detonate. State news agency SANA reports that three civilians were killed and four injured on Tuesday as insurgent rocket fire in Latakia Province in western Syria. Up to 13 rocket shells landed in farms in villages and towns and in and near Latakia city. Meanwhile, the Foreign Ministry has called on the UN to take action over Sunday’s rocket attacks by insurgents on military positions in Damascus. The Ministry cited “a trail of casualties and destruction” from the firing of about 100 rockets by the insurgent faction Jaish al-Islam. It did not mention the military targets but said the areas were “home to houses, hospitals, schools, and headquarters of embassies and international organizations”. Jaish al-Islam said it carried out the attacks in response to sustained regime bombing of insurgent-held areas of East Ghouta near the capital. On Friday, it warned civilians to avoid military positions in the capital. Some weapons shipments were so small that commanders had to ration ammunition. One of the U.S.’s favorite trusted commanders got the equivalent of 16 bullets a month per fighter. Rebel leaders were told they had to hand over old antitank missile launchers to get new ones — and couldn’t get shells for captured tanks. The report, perhaps inadvertently, also tips off the US PR behind the covert program: it refers to Jamal Ma’arouf, who was accused of corruption and war profiteering before his Syrian Revolutionary Forces were defeated by Jabhat al-Nusra in in-fighting in November, as a “trusted commander”. Activists reports that regime forces pushed back the Islamic State fighters surrounding the Deir e-Zor military airport on Monday. Syrian forces attacked farms to the east of the airport, the town of al-Jafra to the north, and the international highway to the south, a local citizen journalist said. “The regime advanced considerably on the international highway front, with lighter advances on the other two,” he said. There are claims of ten Islamic State fighters killed. The jihadists have threatened to take the airport, while fighting regime troops inside Deir Ez Zor city, since early December. State news agency SANA’s response to the series of insurgent victories over the weekend: “Terrorist Organizations Suffer More Losses as Army Strikes Hard on Their Positions”. SANA overlooks the rapid insurgent advance south of Damascus, taking two military bases and threatening to cut the regime’s supply line between the capital and southern Syria; the opposition’s victory north of Aleppo pushing back regime efforts to cut off insurgents in Syria’s largest city; and the insurgency’s support of the successful Kurdish defense of Kobane against the Islamic State. It also has stopped mentioning Sunday’s rocket attacks on military positions inside Damascus.